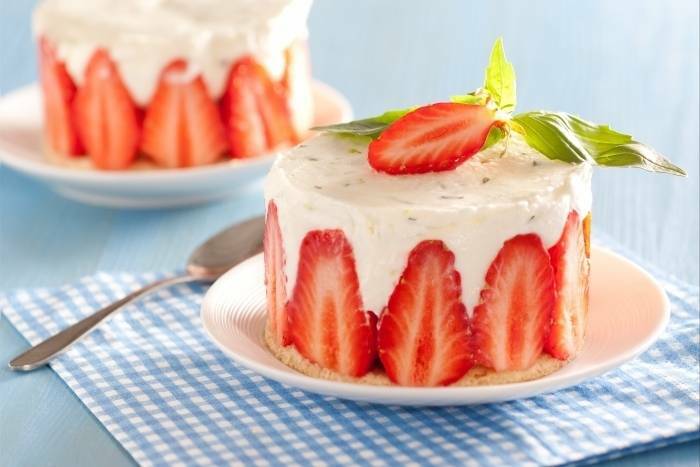 A soft almond sponge topped with fresh strawberries and a lime and basil scented mascarpone cream. Whisk the egg whites until stiff. Whisk in the caster sugar before gently folding in the egg yolks. Sift the flour and the ground almonds together and then fold them into the egg mixture. Spread the mixture on to a baking sheet lined with baking parchment and then bake in the oven for 5 minutes. Allow to cool and then use stainless steel serving rings to cut rounds from the almond sponge. These rounds will form the base of the fraisiers. Cut the strawberries in half and remove the stalk. Place the mascarpone in a bowl and add the basil, the lime zest and the juice. Whip the cream until thick and then gently fold into the mascarpone. Line stainless steel serving rings with acetate. Place a biscuit base in the bottom of the serving rings. Place the strawberries around the edge of each ring, with the flat side facing outwards. Add a strawberry to the centre and then cover with the mascarpone cream. Use a spatula to smooth the surface of the cream and then refrigerate until ready to serve. Carefully remove the serving rings and garnish each fraisier with a strawberry and a small sprig of basil.